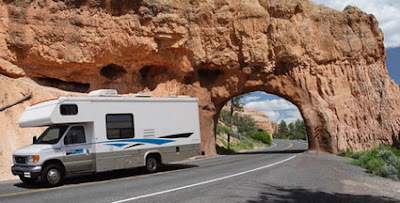 The USA's love affair with modern RV motorhomes dates back to pioneering times when covered wagons headed west in search of new lands and opportunity. As soon as cars became widely available, vehicle owners were adapting them to sleep and live in. Wagons built as accommodation rather than just for cartage were developed in France around 1810 and used in England by travelling performers from the 1820s. Gypsies began living in caravans from about 1850. Although the automobile was invented in Europe (look up Karl Benz for more on that), Henry Ford's assembly line production started in the USA in 1914 -- and by the 1920s the recreational vehicle was well established in the USA, with plenty of RV clubs established nationwide. The modern RV industry began in the late 1920s, shortly after the start of the automobile industry, when companies began manufacturing house trailers. Airstream was one of the early manufacturers, and they're still in business today.